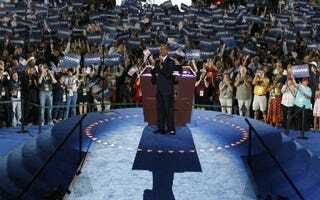 DNC 2012 Guide: Don't Miss These Events! The 2012 Democratic National Convention begins on Sept. 4 in Charlotte, N.C., but the celebration has already begun. Scheduled convention speakers on Sept. 4-5 at at the Time Warner Cable Arena include San Antonio Mayor Julián Castro, first lady Michelle Obama and former presidents Bill Clinton and Jimmy Carter. President Barack Obama and Vice President Joe Biden will speak on Sept. 6 at Bank of America Stadium, where proceedings will close with a lineup including Mary J. Blige and Earth, Wind and Fire. There are also various related events scheduled in the city all week. Check out The Root's guide to select events in Charlotte from Sept. 2-6, ranging from town halls, dance parties, networking receptions, convention proceedings, invitation-only parties and more. Location: Charlotte School of Law, 2145 Suttle Ave. Location: Pritchard Memorial Baptist Church, 1117 South Blvd. Media can register for press credentials to attend. Location: Knight Theater, 430 N. Tryon St. Location: Check for details here. Check here to find out which states go to which events. Location: McColl Center for Visual Arts, 721 N. Tryon St.
Time: 10 a.m. to 6:15 p.m. Performers include Janelle Monae and James Taylor. Museums will be free admission that day. Location: 525 N. Tryon St.
For young professionals and Charlotte's future leaders. Location: Charlotte Convention Center, Room 211AB-212AB, 501 S. College St. Location: Crowne Plaza Charlotte, 201 S. McDowell St.
For questions call (704) 327-7550. Parking, $15. StartUp RockOn at the DNC will be a concert headlined by The Roots, a week-long VIP late-night lounge. Invitation only, Amos Southend. Time: Sept. 3-6, 8 a.m.
Official convention speakers at Time Warner Cable Arena, 333 East Trade St., credentials required: 2012 Democratic National Convention Chair Antonio Villaraigosa will gavel in to officially begin the convention proceedings at the Time Warner Cable Arena, featuring Keynote Speaker San Antonio Mayor Julián Castro, first lady Michelle Obama and President Jimmy Carter via taped video. Sponsored by the Washington Post. By invitation only. Time: Women's Caucus, Ballroom ABCD, 10 a.m. to noon; Progressive Action PAC, Room 213 A, 10:30 a.m. to noon; LGBT Caucus, 203AB, noon to 2 p.m.; Senior Council, 211AB- 212AB, noon to 2 p.m; Small Business Owners Council, 211AB- 212AB, 2-4 p.m.; Rural Council, 203AB, 2-4 p.m. Location: Crowne Plaza Hotel, 201 S. McDowell St. Attendance is subject to venue capacity. Location: RiRa, 208 N. Tryon St. Location: 223 S. Brevard St.
Time: 9:30 p.m. to 2 a.m.
Time: 10 p.m. to 1 a.m.
Time: 11 p.m. to 1 a.m. Location: NASCAR Hall of Fame Museum, 400 E. Martin Luther King Jr. Blvd. Free and open press. Media RSVP to DLemmon@familiesusa.org. Location: The Harvey B. Gantt Center for African American Arts & Culture, 551 South Tryon St.
Time: Native American Council, 219AB, 10 a.m. to noon; African American Caucus, Ballroom- CD, 10 a.m. to noon; Hispanic Caucus, Ballroom- B, 10 a.m. to noon; Americans and Pacific Islanders Caucus, 203AB. 10 a.m. to noon; Ethnic Council, 218AB, 10 a.m. to noon; Faith Council, 203AB, noon to 2 p.m. Location: Knight Theater, 430 S. Tryon St.
Time: 12:30-5 p.m. Sold out. Domestic Policy Forum: "21st Century Campaigns,"
Time: 10 a.m. to 1:00 p.m. Location: Discovery Place's 3D Theatre, 301 N. Tryon St. Location: Mint Museum, 500 S. Tryon St.
Closed press. Tickets are publicly available. Location: Dressler's Restaurant, 1100 Metropolitan Ave.
Rock the Vote 2012 DNC Convention concert, Foo Fighters. Location: The Fillmore Charlotte, 1000 NC Music Factory Blvd. Location: N.C. Music Factory Osso Restaurant and Fountain Plaza. Vice President Biden and President Obama. Musical lineup for convention closing: Mary J. Blige; Earth, Wind and Fire; Foo Fighters. Check here for information on street closures and transportation options in Charlotte.